As they prepared to play their third straight AFC North game to open the season, the Baltimore Ravens had to deal with yet another distracting development in the scandal surrounding former running back Ray Rice’s fight with his now-wife in an Atlantic City casino. On Sept. 19, ESPN’s investigative show, “Outside the Lines,” posted a story on ESPN.com revealing the results of their investigation into how the team and the NFL dealt with what information they had about the fight Rice and his then-fiancée Janay got into in February at the Revel Casino, and when they had it. The story included a timeline starting in February through September, when TMZ Sports released the video showing Rice hit his fiancée with a left hook, sending her head into the elevator hand railing, knocking her unconscious. The report states that according to sources, the Ravens’ director of security was able to get in touch by phone with an Atlantic City police officer, who gave a detailed description of the elevator surveillance video. Sources also say head coach John Harbaugh wanted Rice, wide receiver Deonte Thompson, and offensive tackle Jah Reid (both of whom also had run-ins with the law during the offseason) released, but was overruled by owner Steve Bisciotti and general manager Ozzie Newsome. The team has responded by saying in a statement that the story contains several errors and inaccuracies, and will address them when they return from Cleveland. Before the now-infamous elevator video was released, the Ravens knew they had to play without Rice anyway in the Sept. 7 season opener at home against Cincinnati. However, while the defense played strong and held the Bengals to only five field goals, the offense came out flat and played listlessly in the first half, and went into the locker room trailing 15-0. The offense finally started showing signs of life by putting together a 10-play, 82-yard drive that running back Justin Forsett finished off with a 13-yard touchdown run to get the Ravens on the scoreboard and cut Cincinnati’s lead to 15-7 with 2:20 left in the third quarter. In the fourth quarter, Baltimore pulled to within five on a 38-yard field goal by Justin Tucker with 10:28 left. Less than five minutes later, Joe Flacco hit new wide receiver Steve Smith, Sr. on a long pass, and Smith tossed Bengals cornerback Adam “Pacman” Jones aside with a pair of vicious stiff arms on the way to an 80-yard touchdown. The two-point conversion failed, but Baltimore still had a 16-15 lead. That lead would be short-lived, as Andy Dalton connected with A.J. Green on a 77-yard touchdown, and then hit Mohamed Sanu for the two-point conversion to give Cincinnati a 23-15 lead with just under five minutes left. After the ensuing kickoff, the Ravens drove from their 12 to the Bengals’ 16 in 11 plays. However, Flacco was sacked on each of the next two plays to turn the ball back over to Cincinnati on downs in the final minute. Just four days later, on Sept. 11, after the current controversy started with Rice being cut from the team and suspended indefinitely by the NFL, the Ravens bounced back from their Opening Day loss with a dominant defensive effort against the archrival Pittsburgh Steelers. Flacco threw two short touchdown passes to new tight end Owen Daniels, the Ravens rushed for 157 yards as a team, and the defense forced three turnovers as the Ravens defeated the Steelers, 26-6. After an extended rest, the Ravens went to Cleveland for their first road game of the season for Week 3. After Baltimore took an early lead on a Tucker field goal, Browns rookie running back and former Towson star Terrence West scored on a one-yard leap over the pile to give Cleveland a 7-3 lead with 3:15 left in the first quarter. The teams swapped the lead four times during the second and third quarters, which saw rookie tight end Kyle Juszczyk and rookie running back Lorenzo Taliaferro each score their first career touchdowns. Cleveland led 21-17 after three quarters. In the fourth quarter, former Ravens kicker Billy Cundiff hit the left upright on a 50-yard field goal attempt, and had a 36-yarded blocked by cornerback Asa Jackson. Tucker connected from 21 yards with five minutes left, and then connected again from 38 yards out as time expired to give a Ravens a 23-21 win and a 2-1 record. Both of Cleveland’s losses have been on last-second field goals. The Ravens wrapped up September at home by beating Cam Newton and the Carolina Panthers 38-10. October will start with road games at Indianapolis and Tampa Bay. 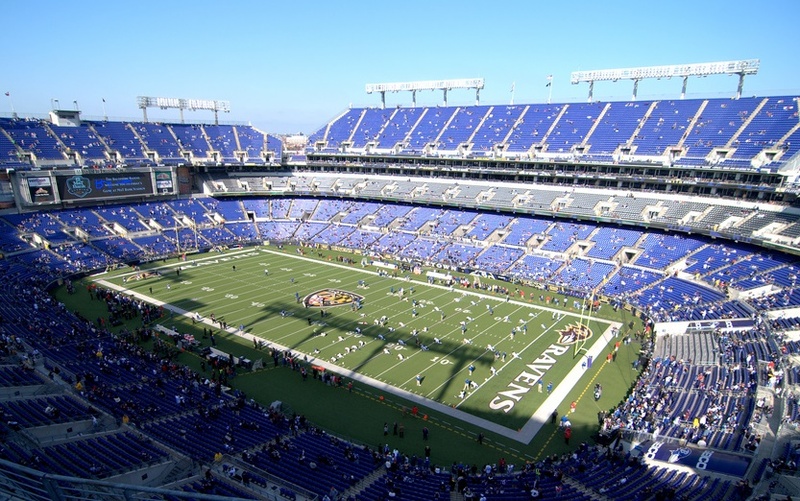 Baltimore will host Atlanta on Oct. 19, and will wrap up the month at Cincinnati on Oct. 26.